I love creating a little series of videos for you sometimes….kind of like a mini public “class”! I had a bunch of flower stamps in my growing stash that I haven’t shown yet, so they’ll be collected together this week into a series. Enjoy! 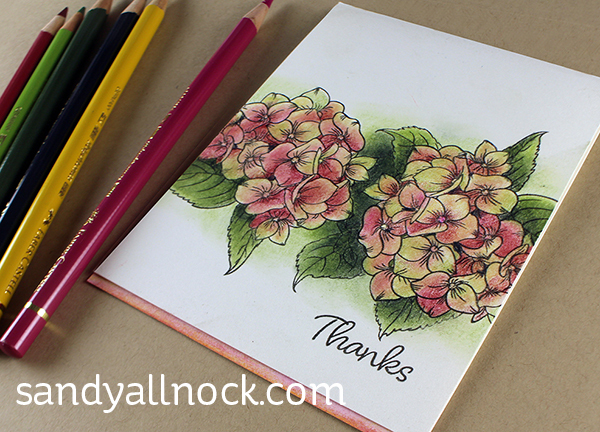 It’s been so much fun to feel like I can dive into more colored pencil pieces here on the blog; they require me to speed things up since pencil takes longer, but now that I know you can get lots of education in the Colored Pencil Jumpstart Class, I don’t feel guilty for all the speed! These hydrangeas are fall/post-season color. Different ones turn different colors but I love the ones that get golden and purple and look so vintage! Watch the video below or click HERE to see it in HD on YouTube. So pretty. Great color choices. This absolute awesome, I love hydrangea not only in summer when they are in full bloom, but when they turn colour in the end of the summer, begin autumn they are also gorgeous. I had a white one ( the Annabella) and it turned light green in the end of summer, great. Thank you so much for this masterpiece with my favorite pencils Sandy. BEAUtiful card. We have a huge “mophead” macrophylla outside our front window. Because of our alkaline soil, it blooms pink, but the aging blooms look exactly like your project. Will break out my colored pencils and give this a try. These are beautiful! I was also admiring the color of my fading hydrangeas. I think I’ll head outside and take a photo! Hi Sandy. I just love your hydrangea coloring. My grandmother gave each daughter a part of her hydrangeas when they bought their homes, so my mom gave me an original plant when we got our home. We moved that baby with us wherever we went, until Arizona finally did it in; just way to hot! You brought back such happy memories. Thank you. 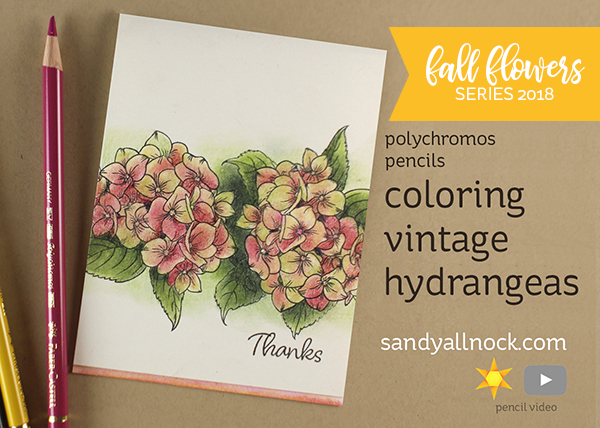 One favor please; could you list the colors of the polychromos you used? Thanks. I agree! I love hydrangeas but in the fall I most love the variety of colors the flowerettes change into. You really captured the fall beauty! I didn’t see your post for the polychromos colors you chose. Can you list them? Gorgeous! Thanks for the video, Love the tips on using the blending stumps! Beautiful. So why polychromos pencils. I thought you always used Prismacolor? How do they conpare? Are they as creamy? I like both and use different ones depending on the colorways I’m pursuing. The hex charts help me decide.